I recently became a BJ’s member and I have to say it is one of the best things to happened to my kitchen.The ability to buy groceries in bulk has allowed me to stock up my pantry with a variety of foods.There are certain ingredients I believe should be stocked up in all pantries, examples are beans, tuna, pasta, chicken stock etc. The wholesale stores also carry perishable foods and the other day I picked up a twin pack of fresh three cheese tortellini for only 9.99. Fresh tortellini only takes 5 minutes to cook making it great for those weeknights when you don’t want to spend an eternity the kitchen.Tortellini is great served with pasta sauce, in soups or in salads.I have a simple recipe for a tortellini salad which is delicious and quick to prepare. In a small saucepan boil frozen peas in salted water for 3 minutes and set aside. 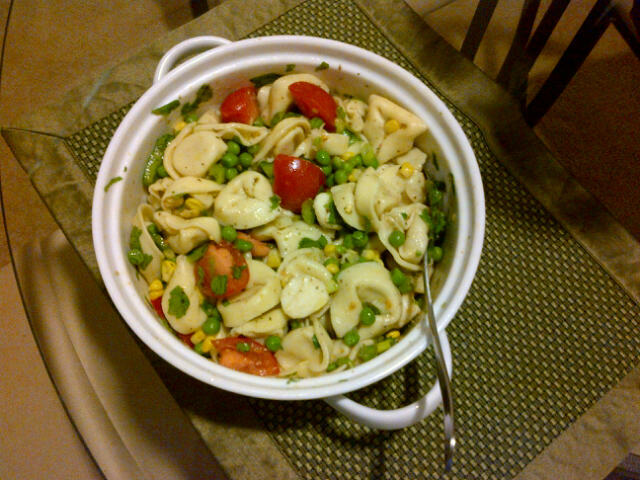 In a large saucepan add tortellini to boiling water and cook for 5 minutes . While tortellini is cooling down chop parsley,basil and cilantro.Slice green onions, cut tomatoes into quarters and half the mozzarella balls. In a large bowl add 2 tablespoons of the olive oil and herb marinade, gently mix with all the the ingredients. I don’t normally comment but I gotta say thank you for the post on this perfect one :D.